Pokebattler dipped its toe into event hosting to help co-host a PVP tournament. There were… a few kinks which provided quite a good learning experience for us for any future events. For anyone there who experienced these kinks, we thank you for your patience. At the end of the day though, we had a successful tournament with winners and everything. We thought you guys might like to look at the results! To see every single result, click on any of the links in the Google Sheet. Note that players may have changed their Pokemon or battle parties since this was run so results may vary! Each participant has a URL showing their results. We have 3 sheets on there for 3 tournaments: Public, VIP, and verified level 40 (an unofficial contest they hosted themselves). Here are screenshots of the final 3 battles and winners. 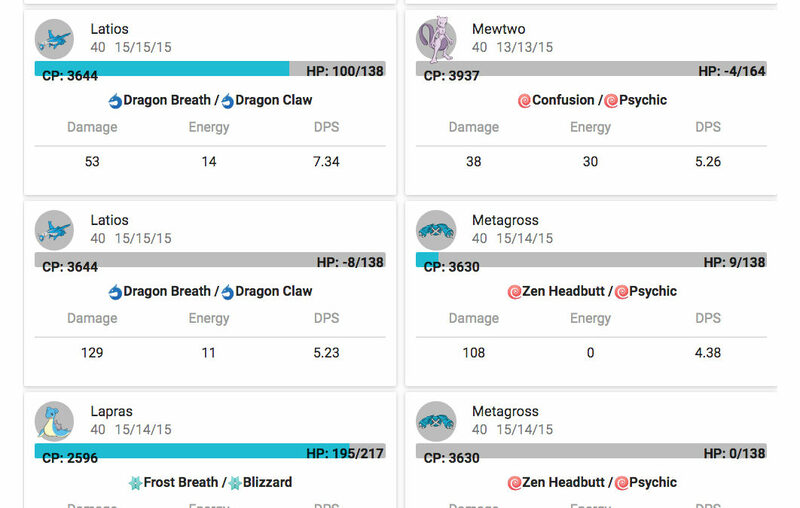 You can see their trainer/ user numbers and look them up yourself at pokebattler.com/pvp to see how you would do against them. Our rules were 6 unique Pokemon, only 2 legendaries maximum, and NO Blissey or Chancey. Yes, Blissey is totally broken in PvP too. Dodge specials was used with perfect dodging by both sides. Overall, tankier Pokemon came out ahead. Yes, that means Aggron. Ugh. Also Lugia, Tyranitar, and Snorlax. So the more useless, but tankier mons (with the exception of the ever useful Tyranitar) are better in PVP. Maybe that’s why the in-game auto-suggest is so in love with tankier mons? Who knows. We are sharing our spreadsheet with our subscribers on Patreon so players can host their own PVP tournaments. Perhaps you want to involve elaborate prizes, punishments, and bets for your contest? Let us know they turn out! Caution: Spreadsheet can be a little tricky, make sure to try it out a few times first. If you don’t have enough players, use user 0, battle party 0 to fill out the sheet.